Where else but "the sweetest place on earth" would you expect to find a month-long event called Chocolate-Covered February? In Hershey, Pennsylvania, the main thoroughfare is named Chocolate Avenue and streetlights are shaped like Hershey's Kisses. The town was put on the map by Hershey Chocolate Company and its founder, Milton Hershey. During the annual month-long chocopalooza, you can dance with the Hershey's characters during the Hersheypark Chocolate Parade, indulge in decadent chocolate treatments at The Spa at the Hotel Hershey, create your own sweet treat during "Try it with Truffles" at The Hershey Story, and more. Everything goes with chocolate in Hershey, and that's never truer than during the first weekend of Chocolate-Covered February when lavish dining experiences at the Hotel Hershey include a five-course Chocolate Dinner Extraordinaire. During this meal, chocolate might be paired with everything and anything from seared jumbo scallop to short ribs. Want to create one of these chocolate-infused dishes at home? Here are some of Hershey's best chocolate recipes. Other chocolate-themed events at Hotel Hershey run the gamut from chef demonstrations to chocolate afternoon teas, and there are also chocolate-themed events are held at Hershey Lodge, a less luxurious but very family-friendly and more affordable option. Note that the Hersheypark theme park is closed in February. But you can visit ZooAmerica and enjoy many activities at the Hershey hotels, including ice skating and swimming in the indoor pools. 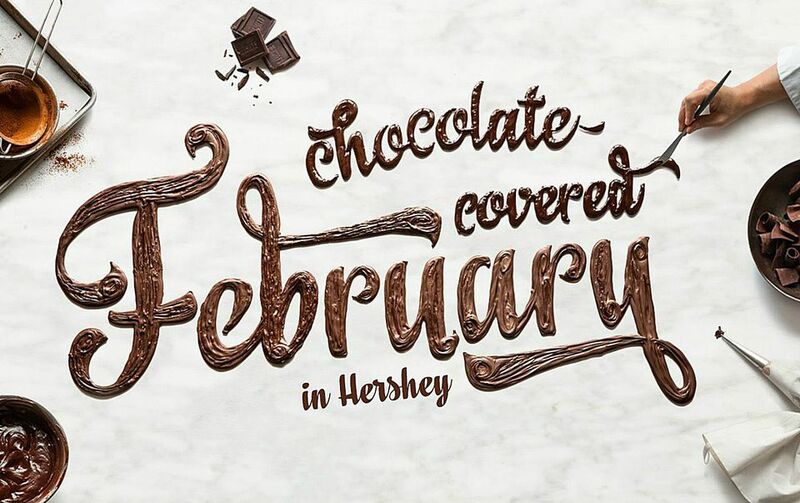 Throughout February, you'll also find many chocolate-themed activities for kids at Hershey's Chocolate World and the Hershey Story Museum. Be sure to check out the special packages offered for this event.